After the recent tragedy in Japan, perhaps non-geologists are a bit less inclined to regard the planet as static and unchanging. But other kinds of geology besides earthquakes and tsunamis happen on a human time scale. Glaciers are one example. When George Vancouver explored Icy Strait in the northern end of the Alaska Panhandle in 1794, there was no Glacier Bay. There was a wall of ice two miles wide and 1,200 feet high where the entrance to the Bay is now. Today, the glaciers have retreated and it is more than 80 miles from the entrance to the snout of Grand Pacific Glacier. When WC was just a pup, the face of Black Rapids Glacier was washed by the Delta River; now the snout of Black Rapids Glacier is 10-11 miles back up the valley. Glaciers are geology in real time. And then there is Hubbard Glacier, at the head of Yakutat Bay. A contrarian icefield, twice in recent years, in 1986 and 2002, Hubbard Glacier has surged and pressed up against Gilbert Point, sealing off the immense Russell Fjord. The many streams running into Russell Fjord backup, creating a glacier-made lake. If the ice dam created by Hubbard Glacier washes out before the water rises by about 40 meters, then Alaskans will just have a spectacle. The U.S. Geological Service has an amazing series of photos showing the 2002 glacier damming event. If a damming event lasts long enough to raise Lake Russell by 40 meters or more, then the water will exit via the Old Situk River channel, at the southeast end of Russell Fjord. The consequences would be devastating for Alaska’s most productive steelhead trout fishery, an important salmon fishery and the village of Yakutat. 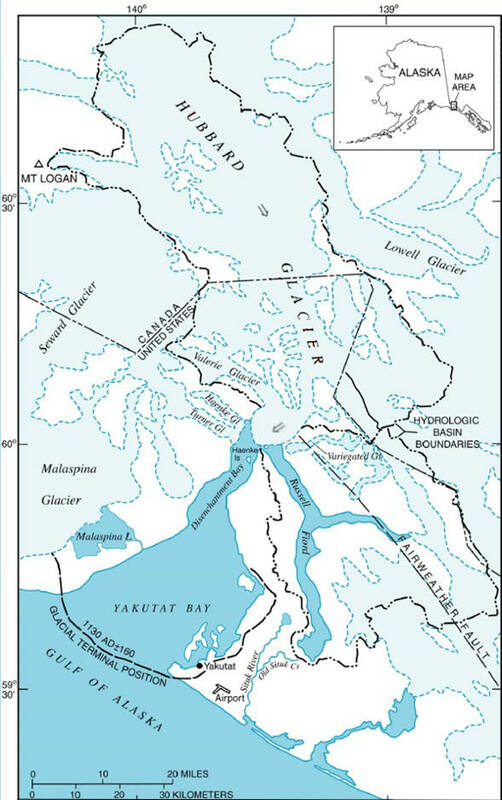 What’s now a lovely clearwater stream and the linchpin of Yakutat’s economy, would become a partially saline, glacial river. The Yakutat Airport, near the mouth of the Situk River, would be jeopardized. 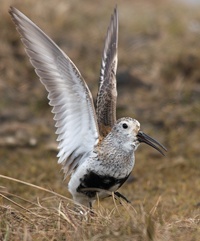 You can monitor the movement of Russell Fjord as it approaches and retreats from Gilbert Point. There’s been the usual, gradual spring advance, narrowing the distance by a hundred meters or so. Keep in mind that these are preliminary data, subject to review by the U.S.G.S. 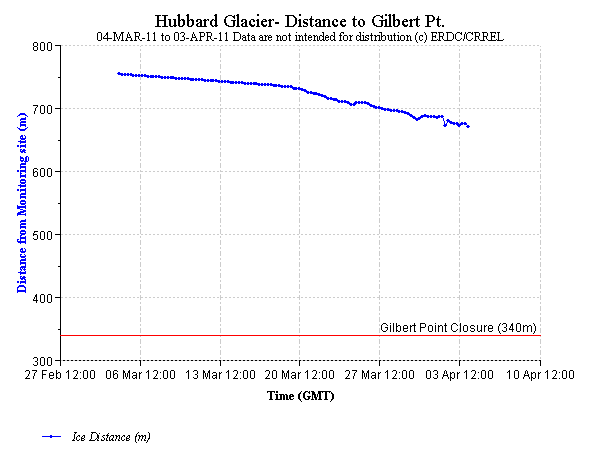 Glaciologists tell WC that it is only a matter of time before Hubbard Glacier seals Russell Fjord again. Everyone knows it. Everyone knows it cannot be stopped. And while it might be possible to create an alternate stream channel that would save tie Situk River fishery, there’s no political will to do so. The loss of a world-class steelhead fishery that WC is very fond of it the least of it. But it is geology in real time. Thank you, WC. I had no idea a glacier could move that rapidly — barely detectable movement is called “glacial.” If I’m reading the graph correctly, it shows movement of 5-6 meters per day, or several inches per hour. If it were advancing over the ground, the visible advance of that mass of ice would be — “awesome” has lost its punch, but I can’t find the right word at the moment.